It snowed in Tokyo yesterday. Quite heavy and by morning we're sitting under around 30cm. 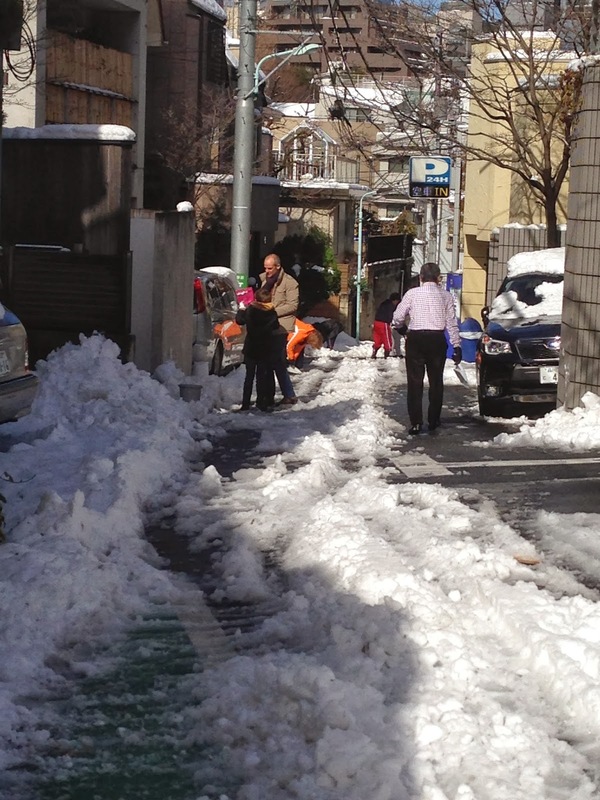 Snow is rare in the capital, we tend to be sheltered by the mountains of central Japan and warmed by the pacific waters. As a result, when it does snow it's quite an event and apparently this was the heaviest fall for a number of years. One of the puzzles for me though has always been why people clear the snow from in front of their houses. Last year there was a snowfall and where people cleared it away it simply froze into iron hard mounds that took days to thaw. No one has ever managed to explain to me why this is actually an improvement on leaving it to melt naturally on the ungritted roads. However everyone has insisted they should be out shovelling and there is a genuine feeling of guilt mixed with embarrassment for those who's houses remain snowbound. Today though was different. Today it's Sunday. More people are at home and given the travel warnings many have chosen to stay in town rather than head out for the weekend. And as a result, when I went outside to clear the snow I bumped into half the neighbourhood. Now I know why people clear the snow, because it's actually quite nice to say "good morning".